SEOUL, Korea – August 11, 2011 – Samsung Electronics Co., Ltd, a global leader in advanced semiconductor technology solutions, announced today volume production of SSDs (solid state drives) that support the Serial ATA Revision 3.0 interface with data transmissions at six gigabits per second (6Gb/s). The new high-performance PM830 SSDs are available at up to 512 gigabyte (GB) densities. The SATA 6Gb/s SSD shortens system boot-up time to about 10 seconds, while its high-performance allows users to download up to five DVD video files in less than a minute. The 512GB SSD utilizes Samsung’s most advanced 20 nanometer (nm) class 32Gigabit multi-level cell (MLC) NAND memory chip incorporating the toggle DDR interface. A proprietary NAND controller facilitates exceptional performance levels that take full advantage of the toggle DDR architecture and the SATA 6Gb/s interface. The new SSD doubles the performance of a SATA 3Gb/s drive, with sequential read speeds of 500 megabytes per second (MB/s) and sequential write speeds of 350MB/s. The drive also features the industry’s highest level of security, which uses an AES 256-bit encryption algorithm to protect personal or corporate data from unauthorized access. 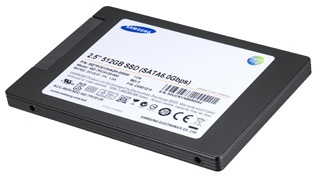 Samsung’s SATA 6Gb/s SSDs are available in 512GB, 256GB and 128GB densities. 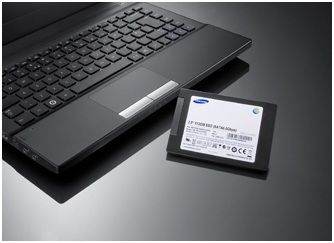 The new high-performance SSD line-up is targeted for use in premium OEM notebooks, and tablets. According to market research firm IDC, the global outlook for client-side SSDs is expected to grow ten-fold from 11 million units in 2011 to 100 million units in 2015. Moreover, the use of NAND in 256GB SSDs is forecast to more than double from 19 percent of all NAND used in SSDs in 2011 to 42 percent in 2015. Further, demand for 512GB SSDs is expected to grow from a 0.3 percent portion in 2011 to eight percent in 2015, also underscoring the growing interest in higher density SSDs.